�The Moon was a stark and otherworldly place; gray soil, gray rocks and black sky as far as you can see,� explains Alan Bean on Apollo Moonscape. �When I first began painting the Moon, I painted it exactly as I remembered it as an astronaut, much the way it looks in the photographs. But a literal record of this black-and-white world doesn�t communicate what it felt like to be and work there. To the astronaut-engineer-scientist in me, the paintings looked correct. But they didn�t completely satisfy the explorer artist in me, the part that loves color and impressionist paintings. �Over the years, I noticed that the paintings that I find most interesting depict nature in more beautiful hues, and with more color variety, than I can see in the world around me. I decided to make a series of color studies inspired by Monet. These paintings were done over several years in an attempt to find the limits of colors that could be used to realistically portray the Moon. I chose a photo of Apollo 17 astronaut Gene Cernan at work in the Taurus-Littrow region as my scene. 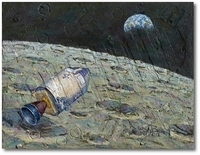 The four paintings assembled into a single presentation give Alan Bean�s Apollo Moonscape, An Explorer Artist�s Vision a Pop Art feel while presenting a wonderfully graphic example of the artist�s visual journey. 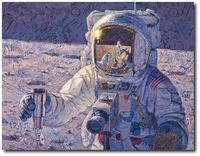 You have your choice of either a fine art canvas or paper gicl�e of the work, each signed by Apollo 12 astronaut, moonwalker and explorer Alan Bean. Own your own piece of art history, the first paintings of another world by an artist who was actually there! "Apollo 12 is Headed Home"